Anholt is at the heart of Danish waters. 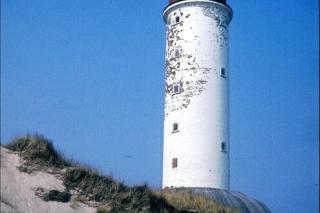 So the island has played an important role in Danish lighthouse history. It had one of the first beacons in the country, dating back as far as 1560. The island's first brazier beacon needed a lot of firewood. It was quickly replaced by a tripod beacon that was raised by a lever. This was replaced by a brick lighthouse in 1788 that was built by Ernst H. Peymann, an engineer and officer. During the war against England in 1807-1814, Anholt Lighthouse was the crux of a dramatic conflict. All lighthouses in Danish waters were kept unlit to mislead British warships. In 1809, the British retaliated by invading Anholt and relighting the beacon. They built Fort York" around the lighthouse. Up to 400 British soldiers were assigned to hold the fort when the Danes attempted to take back the island in 1811. During the war, Ernst H. Peyman, who built the lighthouse, participated in surrendering Copenhagen to the British. He was sentenced to death for his actions but later pardoned. "